A storm was kicked up by a remarkable story about a Toyota Land Cruiser that apparently malfunctioned when on cruise control. 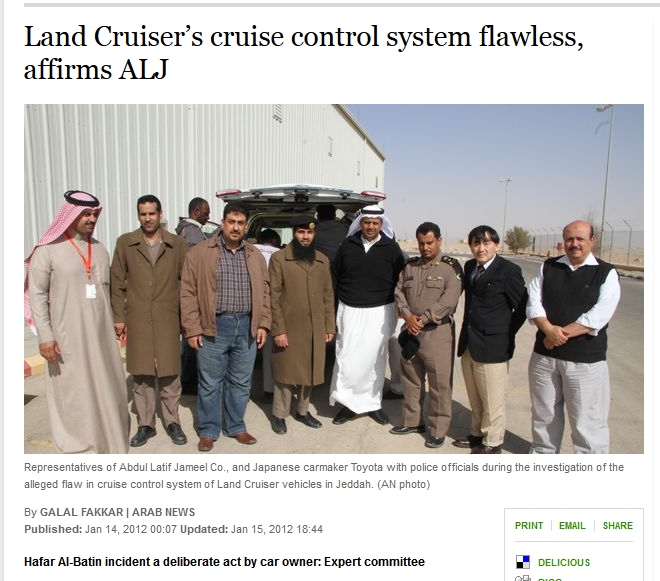 I wrote briefly about the story a couple of weeks back, but to sum up the incident (you can find the original story here in Al Hayat newspaper in Arabic here) a Toyota Land Cruiser was stuck in cruise control at a speed of 210 kilometers per hour. The car was stopped by police who shot a number of live bullet rounds at the vehicle. Luckily no one was harmed, but the story rapidly went viral on social media and #ToyotaCruiseFailSa was a top trending hashtag in Saudi for days. Toyota’s distributor Abdul Latif Jameel has crafted a sterling reputation as one of, if not, the best provider of automotive service in the Kingdom. Following the media reports of what happened in Hafr Al-Batin the company apparently tested the car along with several governmental bodies. To cut the story short, Abdul Latif Jameel arranged a press conference to explain its findings and response to the incident. The seriousness of the incident and its brand implications was underlined by Abdul Latif Jameel’s decision to hold the event on a Friday, the weekend over here in the Kingdom. After a series of tests on the car and what was Abdul Latif Jameel’s explanation? Hafar Al-Batin incident a deliberate act by car owner: Expert committee (byline from the follow day’s Arab News which can be read here). 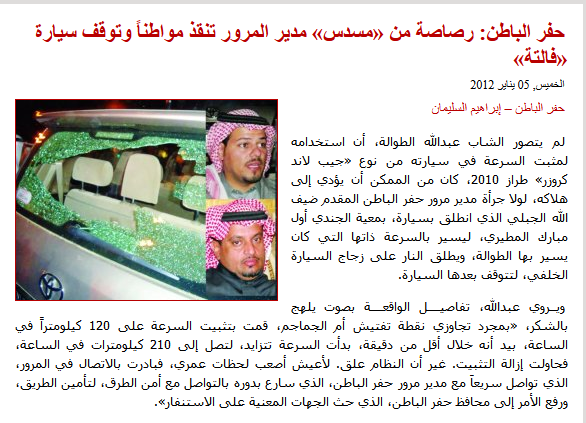 To paraphrase from the article, Abdul Latif Jameel laid the blame for the incident solely on the car’s owner. I’m not going to jump in and get into the nitty gritty of car mechanics, but would anyone be surprised if a customer didn’t respond after having a near-death experience with your product? What concerned me was that the Saudi media didn’t reach out to the car’s owner to verify what Abdul Latif Jameel’s executives had said. Instead, they reported one side and not the other. The above is pretty much a bog standard response from firms based in Saudi, to deny there’s a problem or that if something has happened that it is their problem. Would I want to buy a product from a company that shoves the blame onto the product owner? That doesn’t apologize, even if it isn’t their fault? I had the pleasure to meet with Colin Hensley, Former General Manager of Corporate Affairs & Planning, Toyota Motor Europe, Belgium, at the Saudi Brand and Communications Forum last year. Toyota was put through the ringers in 2010 for all of their recalls. Then the largest car manufacturer in the world, Toyota recalled over 7.5 million cars. Colin told me how Toyota had learned valuable lessons from the incidents and was now putting those lessons into practice. I would have hoped that Toyota would have shared those lessons with Abdul Latif Jameel. One day after the Abdul Latif Jameel press conference the distributor puts out another news story. 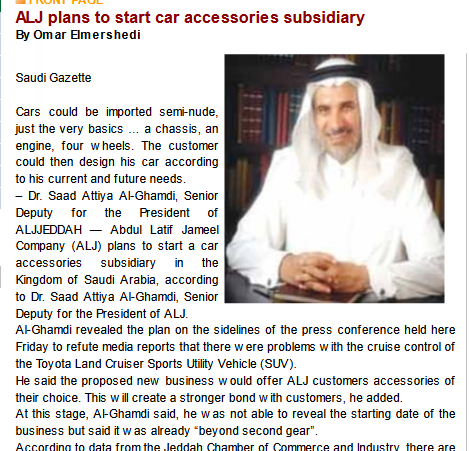 Abdul Latif Jameel plans to start car accessories subsidiary. I’m not making this up unfortunately. Let’s hope someone sees the funny side of this, as I don’t. This entry was posted in Uncategorized and tagged #ToyotaCruiseFailSa, Abdul Lateef Jameel, Abdul Latif Jameel, corporate communications, crisis, crisis communications, PR Crisis, social media, Toyota, twitter by alexofarabia. Bookmark the permalink.